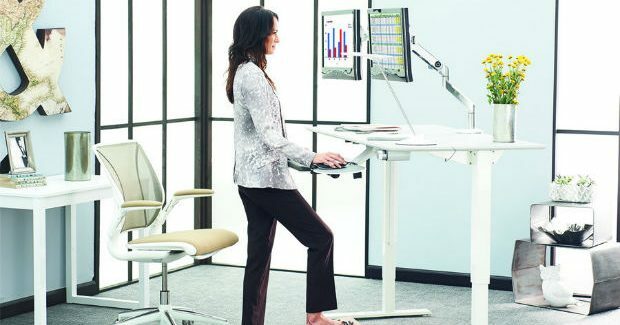 Sedentary working is a new top health risk that is getting increased attention from health and safety professionals. Sitting for long periods is thought to slow the metabolism, which affects the body’s ability to break down body fat and regulate blood sugar and blood pressure. However, more research is needed in order to clear up some confusion over how employers can protect their staff from the perils of sedentary working. Although studies have linked excessive sitting with obesity, Type 2 diabetes, some types of cancer and early death, most of the evidence is based on observational studies, which have failed to show a direct cause between sitting and ill health. Furthermore, more reliable research is needed into workplace interventions, such as sit-to-stand desks. Although sit-to-stand desks can reduce sitting time by 30 minutes to two hours a day, their effect on workers’ health is still unclear. Stand up for at least two hours per day. Set a reminder to stand up every 30 minutes. Stand instead of sit whenever it is practical, such as during meetings or whilst on the phone. Walk over to colleagues’ desks for conversations instead of emailing or phoning them. Use the stairs instead of the lift as often as possible. Content creator for the Adler Insurance Group.